Today I found some beautiful, fresh trout and they reminded me of the region where I grew up. Of the forest and its little streams meandering between trees, passing by the trout ponds which are close to my mother’s house. 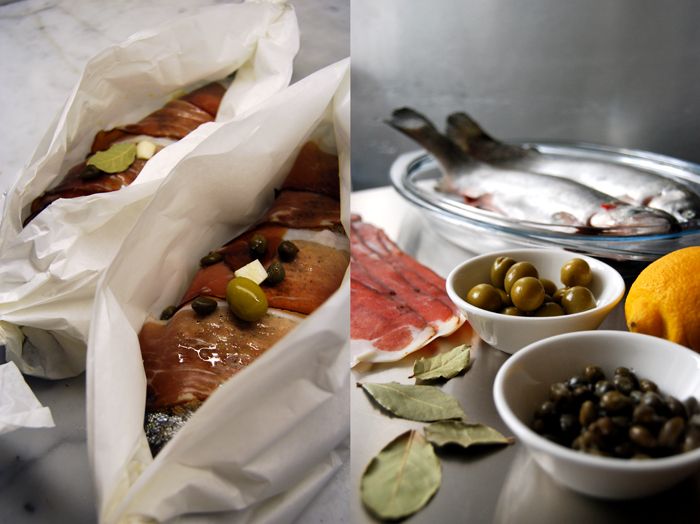 I decided to get two of them and cook them al cartoccio – in parchment paper – together with Tyrolean prosciutto, olives, capers, garlic and bay leaves. 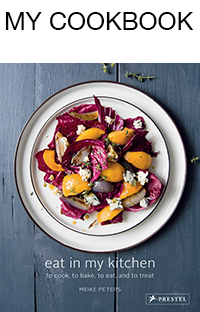 Trout has a strong, earthy taste which makes it perfect to combine with other stand out flavours. The closed parchment paper package makes this union of tastes even more intense. As extreme as this combination may sound, it is a perfect match. 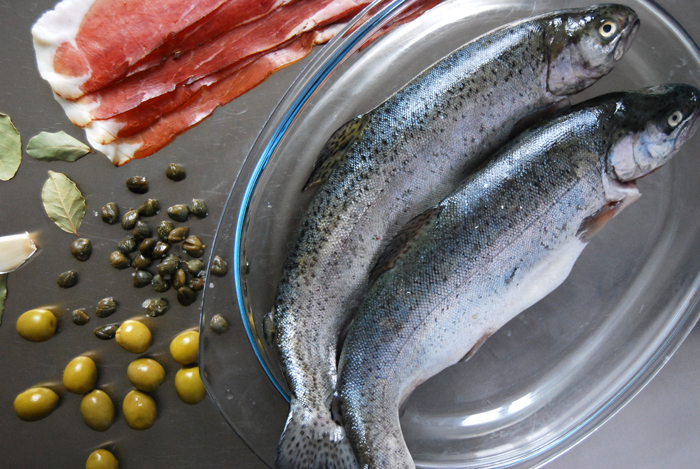 The trout can take the smoky prosciutto, the bay leaf, the olives and capers without loosing any of its own qualities. The best part is opening the hot paper package on your plate and smelling the different aromas. Dip some bread in the juices and enjoy with a glass of white wine! Rinse and dry the fish, season with salt and pepper (inside and out). You need to prepare 2 parchment paper packages for 2 trout: for each package put 2 layers of parchment paper on top of each other, each around 20cm / 8″ longer than the fish. Brush the top layer with oil. 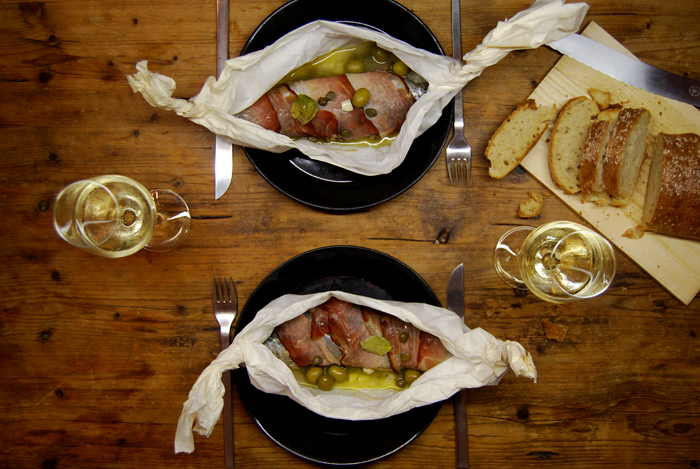 Wrap each trout in 3 slices of prosciutto and place it in the middle of your oiled parchment paper. Put one bay leaf in the fish and one below. Fold up the sides of your package, twisting the ends without closing the top and fill with half of the olives, capers, garlic, olive oil and white wine. Close the top and fold twice. Repeat with the second trout. Place both bags in a baking dish or pan and put in the oven for 10-12 minutes (depending on the size of the fish). You can tell the fish is done when its earthy smell starts to fill the air. Carefully open one of your packages, if you can lift the flesh off the bone with a fork it’s done.